The stadium in southern Ghent was initially hoped to open its doors already in 2006, but after series of issues that couldn’t happen for the next 6 years. It was a difficult time for KAA Gent fans as their club was among the most important ones not to have a modern stadium after Euro 2000. First presented in 2003, the renderings were very impressive. Let’s keep in mind this was before the likes of Allianz Arena were opened, when the idea of multi-sensual or even multi-event arenas was still young. At this early stage Ghent saw a concept of stadium conjoined with offices, a brand new mix both aesthetically and functionally. From 2003 supporters had to wait until 2013, though once under construction in 2011 the stadium was progressing very fast, with no major setbacks. When ready, it represented a standard unseen across Belgium. The exterior is as planned: blue glass represents KAA Gent colours on one hand, while on the other fits well in the business image of office spaces inside. Presence of a football stadium inside this rectangular, slightly curved building is signaled by the roof covering spectators that grows significantly over the remaining facilities. At night LED lights appear between the glass cladding. Though they seem quite far apart from each other, columns of diodes are able to display clear shapes and messages. Inside the stands kept within one compact tier give the impression that the stadium is much smaller than stats claim it to be. 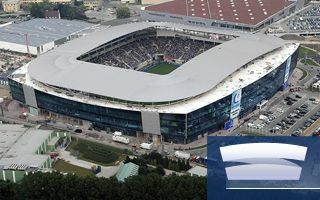 But with 1,200 business seats and 20 skyboxes it really does hold the 20,000 people officially stated, providing a stable and prospective environment for KAA Gent to grow. Already viral around the web, photos showing the stadium’s spectator facilities are very popular. Ghelamco Arena indeed has elegant and comfortable plazas for fans, with tables and sofas to take a seat and discuss the game between the two halves. And no, we’re not talking about corporate facilities only, these are the conditions for regular fans as well. On one hand impressively carried out and still original despite some age of the design idea itself. On the other hand both functional and ecological (rainwater recovery, soon to be installed photovoltaic panels), this stadium was delivered with a budget of €50 million, one many cities and clubs could envy! Belgium’s new football gem is surely among more interesting candidates in this year’s Stadium of the Year selection. But is it the most interesting? You’re the judge, so don’t forget to vote!